At almost 40, Tim Freedman, Bernard Zuel discovers, has decided to make some changes. Tim Freedman has this tic when he begins to feel uncomfortable during an interview. And it begins with silence. Normally the singer/songwriter from the most successful independent band in the country, the Whitlams, is not just loquacious but, in keeping with the band name, a man who enjoys playing with words, a man who loves crafting a sentence sounding like an Algonquin-style epigram, then letting it sit there to be enjoyed. When the dangerous conversational shoals are reached, during the long silences preceding answers, he runs his hand back through his hair time and time again, rougher each time. As if trying to rub the idea out of his mind. As if punishing himself for allowing the conversation to drift into areas where he’s uncomfortable. But Freedman doesn’t run away from the questions. Never has. Instead, he’ll mutter, “Why on earth did I get into this?” to himself, and follow it with a laugh of exasperation. The tricky topic today, as he sinks his fork into his ruby snapper, a glass of white at hand (“I haven’t had a drink for a week, but I like to drink when I’m being interviewed. To make it bearable,” he half jokes), begins innocently enough with his confession that he’d love to write a memoir, eventually. A companion piece to the voluminous band videography he’s released on DVD. Surely, the obvious question upon hearing this comment from a man who has never married, lives alone and is turning 40 soon is: do you put yourself in that category? And it’s here that we hit the first long pause and the pushing back of the hair. “Ah [pause], no [long pause]. Because although I’ve been a little hard to pin down, I don’t think I’ve given anyone the expectation that it’s going to be different,” he says. Does he say to them, “I’ve lived on my own for years, I’m this and not that and you should know this before you get involved with me”? Freedman, at 39, has lived in the same Newtown house for more than 15 years, played in the same band for 12 years, followed the same football team since early childhood and voted the same way at every election. Change isn’t necessarily common. So is this some age consciousness? Freedman has compiled the four-hour DVD, most potently images of the other two founding members of the Whitlams, his close friends Stevie Plunder (born Anthony Hayes) and Andy Lewis, who both died of presumed suicides in the ’90s. “I wanted to do justice to the guys that helped form the band, my aesthetic, my ethos; two lovely fellows who took their lives,” he says. After a dozen years of touring, recording and memories, Freedman took “long service leave” for three months this year in the middle of a year without a Whitlams tour. Freedman likes that kind of line: droll, possibly self-revealing, but probably not. At all times it’s a line aware of its place in the world and enjoying it. Like his favourite writing (Saul Bellow, John Updike, Phillip Roth, Bob Ellis). Like his next thought. 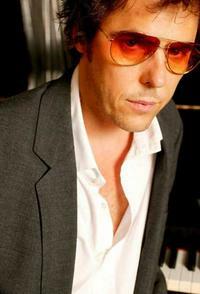 Tim Freedman plays at the Basement this Thursday and Friday.